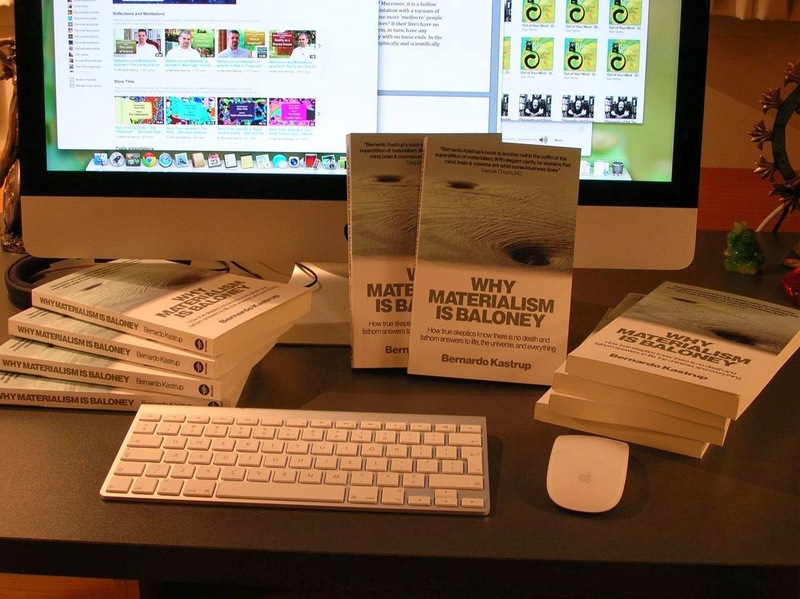 Author copies of my book Why Materialism Is Baloney. Bunzel hit the nail on the head, in the sense that this is the question I was faced with when the book was just an idea. It is fair to expect that many materialists are so entrenched in their position that my book won't change anything for them. That said, I still hold onto the belief that many other materialists are open to sound argumentation and that the book may have some value for them. This alone, in my mind, justified writing it. Now, the part of Bunzel's statement that I want to explore further is this: he suggests that the book may not add much to people who are already inclined to a non-materialist cosmology. I meditated long about this point and became convinced that it's not true. Here is why. There are two types of knowing: intellectual and experiential. The first is an indirect form of knowing that entails conceptual models in our heads. The second is a form of direct, intuitive knowing by experiencing the truth of what is known. Only experiential knowing has transformative impact. In spirituality circles, people refer to this form of knowing as 'knowing with the body,' or 'kinesthetic knowing.' Philosophy, on the other hand, is about intellectual knowing. It's based on conceptual models that point to truths, not on a direct experience of these truths. In other words, philosophy can help you convince yourself intellectually that e.g. mind is only one, or that the subject is not separate from the object. Yet, every time you look at a tree you will still see a tree out there, separate from you. Every time you look at another person you will still see a person out there, separate from you. As a work of philosophy, my book is about intellectual – not experiential – knowing. So how can it improve one's life? Why does it count? It counts because we live in a largely rationalist society where the intellect has gained enormous power. When we make choices in our lives, even trivial ones, people around ask us "why did you do it?" When we hold an opinion about something, people around ask us "why do you think so"? These questions are requests for intellectual justifications for our choices and opinions. They implicitly assume that no choice or opinion is valid without such intellectual underpinnings. Society's pressure in this regard is so dominating and ubiquitous that we often require such justifications from ourselves. Even if our intuition or experience screams that a certain choice or point-of-view is the correct one, we do not find peace until we can attach a reasonable intellectual story to it. Many of us do not give ourselves permission to embrace a point-of-view that resonates with our intuitions and experiences unless and until that point-of-view can be couched and mirrored by an intellectual explanation. The intuition and inner experience of many people today are taking them away from the madness of materialism. Neo-advaita, Buddhism, Non-Duality, Mysticism in its many forms, meditation, psychedelics, and many other paths to the direct experience of truth are playing an enormously positive role in waking people up from the trance of a materialist society. Yet, many of these people live according to a schizophrenic cosmology. A break arises between their direct spiritual experience and what their intellects can accomodate and justify. On the one hand, they experience a reality of pure consciousness and no separation. On the other hand, they know that a well-placed knock to the head ends consciousness quite effectively. How come? How can reality behave as though materialism were true, while our spiritual experiences inform us otherwise? We become split. And here is the key point: I believe that a person in such a split condition does not give herself the freedom to truly embrace a direct experience of the truth. Deep inside, we hold ourselves back, because the intellect stays conflicted and in doubt. Unless and until we can find a place in the intellect for the truth that is directly experienced, I believe we do not let ourselves go. Unless and until we can make intellectual sense of the fact that e.g. the brain seems to generate consciousness, we do not allow ourselves to truly embrace, unreservedly, a non-materialist cosmology. This is the role I believe the book can play. It can aid experiential knowing by couching it in reasonable, skeptical, empirically-substantiated intellectual knowing. In itself it won't be as transformative as a direct experience of truth, but it will help one open up to such a direct experience without the reservations that could otherwise block one's progress. As such, I ultimately disagree with Bunzel's suggestion that the book is unnecessary for those already open to a non-materialist cosmology. I believe it will give these people intellectual permission to truly embrace what their intuitions and experiences are already telling them is true. Well said Bernardo. Ultimately the intellect must step aside for the experience of "direct knowing" to arise. But the intellect can form a pathway that exposes us to the experience and what the experience MEANS. Well said Bernardo. I've been arguing a similar line of thought on the question, "What is the purpose of life", which I think has the hidden assumption that there is an intellectual, analytical answer to this question. I think the full answer to that question may have to come from direct knowing, which NDE'ers seem to attest to when they suddenly find in their NDE that "everything makes sense" in a way that is beyond what their intellect can sufficiently convey after the fact. Hi Bernardo - thanks for your comment on my review.It is my belief that only a "shock" can open materialists up to the deeper understanding as to the "meaning" of their empirical findings. One can have the shock by looking up at the night sky and suddenly seeing the brute reality that there is no "outside border"; I had it when I realized that DNA was code and so it had context and meaning (and intelligence) beyond what humans had programmed because it's been in our cells for millions of years. A UFO landing might administer such a shock on a broad level... But until the shock is administered, unfortunately, thoughtful analyses like yours will go largely unread and misunderstood by those who most need to comprehend them. And also, as you said, perhaps the word "unnecessary" was too strong because I for one find all such examinations profoundly significant; however once someone "sees" this experientially further "evidence" is really not required to the extent that the shift seems to be an either/or duality and I'm not sure there are degrees of seeing. Although in my example above, I had an inkling of this when I first contemplated the night sky and it did not deeply land for me until I had done some meditative practice and had had the shock of recognizing that DNA code worked on a very high degree of precise context--and so "who" was the programmer? Indeed in our scientific/religious age (our priests are scientists) this is the only "proof" that many people can really take in--and as you convey it--mainly through metaphor. Still there is something deeply binary about the "shock" of recognition--it's almost like impact of a psychedelic that as you suggest breaks down the brain's filters of reality -- and the yes/no probably has to do with suddenly understanding the absurdity of the existence of a separate egoic self. That veil needs to be pierced before your very eloquent arguments can get through. Thanks for taking the time to comment. Maybe a proper intellectual articulation of reality creates the necessary conditions -- the necessary 'unconscious' openness -- for the shock to be recognized and abide when it happens? Maybe the intellect facilitates the occurrence of the decisive experience? Hi Bernardo - ironically, another take on your point (the value of intellectual understanding) comes from supposedly materialistic neuroscience. When we have difficulty with certain emotions such as fear or anger, using our left hemisphere to label the emotion can support our prefrontal cortex (the 'director" of our brain; or at least, when functioning well, it is) to calm the emotion, enabling us to quiet our mind and open our hearts. In that sense, even those with some nondualist experience may find that they are far from integrating that experience in everyday life. And if you read even the writings of very well known teachers like Adyashanti, you find he acknowledges all kinds of ways in which his psyche and body and emotions are not fully integrated. What you are doing, I think, is providing one way for the left hemisphere to help those newly awakened to nondual experience to more fully integrate the different aspects of their psyche. Very important work. Thanks Don. In the book I try to make some sense of this process of self-reflection that you allude to (one part of the psyche reflecting upon what another part of the psyche is undergoing). The intellect is the most self-reflective segment of the human psyche. And because a self-reflective apprehension of an experience really helps in integrating it and making it stick ('abide,' in Adyashanti's terms), I do agree with your conclusion. Cheers, B. So your book's almost out? Is there a date? I agree with your response to Tom Bunzel. We are all to a significant degree creatures of culture and all to some degree influenced by evidence, argumentation, and persuasion. That's why materialists (or anyone else for that matter) gather in communities and reinforce with each other their basic convictions, along with their rejection of the alternatives. The problem with the materialist paradigm is just that its roots are so deeply sunk into the culture and its tentacles have so thoroughly reached into everything that it will take a constant drumbeat from thousands of sources to begin to change things. What more honorable or vital role could there be than to be one of those drumbeats? I also agree that the intellect can lead one to and support direct experience. Personally, though, I think it has crucial functions that direct experience cannot really fulfill. For instance, how do we decide between competing direct experiences? Do we choose the impersonal absolute experienced by Advaita practicioners? Or the boundary-less God of pure love encountered by near-death experiencers? Or the ethnic God coming soon in wrath encountered in visions by many in traditional religion? And even if we have rooted ourselves in the right direct experience (whatever that turns out to be), it seems to me that the ego can still run the show. How else do we account for Buddhist meditation masters who treat women as second-class citizens, or Indian yogis who support the caste system, or Zen masters who actively aided the Japanese war effort in WWII or committed harakiri when the Emperor surrendered (two things I have read about, though I don't know how solidly established they are)? It's the intellect that gave us the Enlightenment, and in so doing did more for the equality of the sexes, of the classes, of the races, and of the countries than (alas!) our spiritual traditions have ever done. Hi Robert! 25 of April is the date. The book is already available for pre-ordering on amazon.com and amazon.co.uk. See the links here: http://www.iff-books.com/books/why-materialism-baloney. The subject of your second and third paragrapha is very much a part of my intellectual life these days. I have been writing a new book where I discuss precisely that. Would you like to have a look at the draft? I could use some comments. Otherwise, no problem. We're all too busy. Bernardo, yes, I'd very much like to have a look at your draft. Those are issues that have been important for me for a long time. It will be very interesting to see where someone else goes with them. Thanks Robert! I've just emailed you the document. Cheers, B.
I just received an Amazon update that the book should arrive April 9. That is 3 weeks earlier than anticipated! I'll be buying your book when it comes out on Amazon UK, Bernardo, and I have no doubt it will add to the fuel for the fire that should help keep the materialists at bay, as well as maybe shed enough light to persuade some of them to approach with an open mind. There's lots of intellectual fodder in those two sources. Thing is, though, it isn't a merely intellectual issue: were it so, everyone and his dog would already have accepted that materialism is baloney! Thanks for the links, Michael. Previous experience tells me that the stuff you recommend tends to be quite interesting, so I'll have a look this weekend! Cheers, B.
Bernardo, I just finished "Why Materialism is Baloney" this morning. Your exposition is clear enough that even I may be able to process it. Now to let it stew in my brain for a few days and read it again. One thing is for sure: Materialism must be put to bed at last. I agree, there is no real dialectic between Idealism and Materialism. Even though I grew up believing that science held the answers to life's mysteries, deep down I always approached questions from an artist's perspective, which meant that knowledge was not 'real' until it was felt in my bones. Your flavor of Idealism seeps into my bones. You may not have all the answers but you are definitely on the right road. Anyone else read Bernardo's latest book yet? Just curious. Thanks a lot for taking the time to tell me this, Buz! Feedback like this is what motivates me (and most people who write, I guess) to continue. Cheers, B.
I started the book as a realist and had the split you mention above so I can't thank you enough for showing me how to start removing that wedge. It is helping me shape the puzzle piece of 'my mind' to better fit into the puzzle of 'the mind' so to speak. For whatever reason, Amazonopoly wouldn't let me give it 10 stars so I had to go with only 5. Thank you Carl! I'm very happy to hear the book resonated so well with you!